After securing a new Bitstamp all-time high at $2,980 (third breakout in less than a month) bitcoin started off with a $300 price correction on Monday, before plummeting to a new weekly low of $2,480. 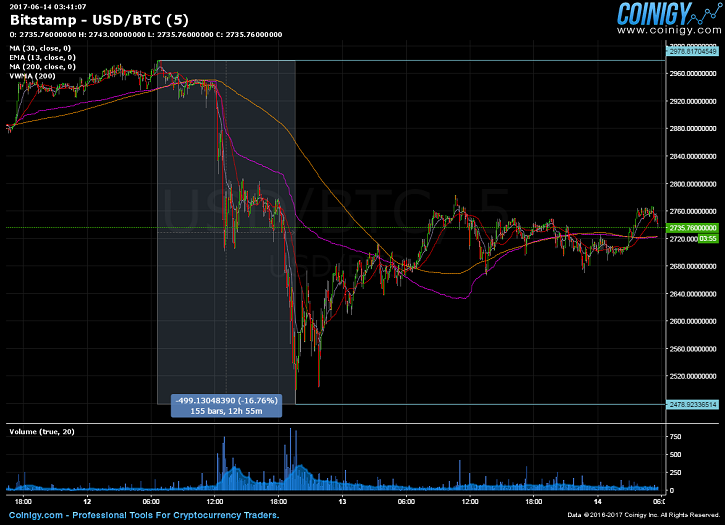 A trading range between $2,700 and $2,800 was briefly held before the final bottom was reached. The psychological $3,000 barrier was broken on countless other exchanges such as BitMEX, Okcoin, and Huobi but failed to materialize a breakout above that level on predominately US dollar denominated trading sites such as Kraken, GDAX, and Bitfinex. GDAX also symbolically hit $2,999.99 which was strangely close to a push into the 3000s. 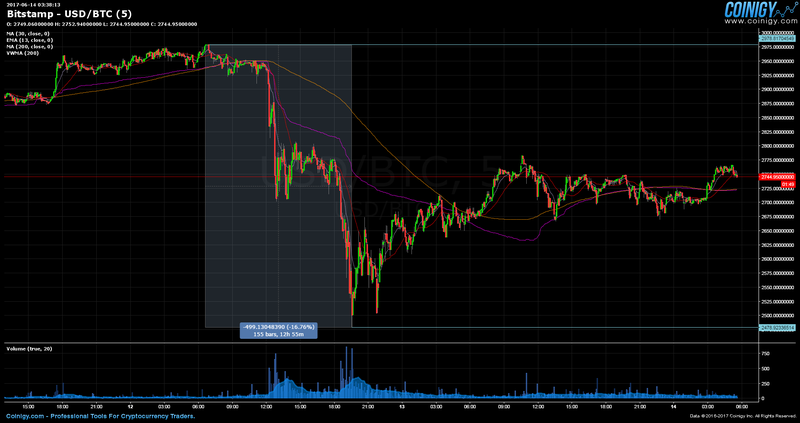 The exchange is currently inaccessible as of this writing even though a new all-time high was set at $2,889.49. The platform is under DDoS attack. We are enabling a stricter protection level. The bitcoin market cap had been growing steadily during that same period ($45 billion to $49 billion) until Monday, when market activity resulted in a drop to a level that was $120 million below the previous $42 billion. It has since then held close to a $45 billion dollar market valuation despite daily fluctuations. Another factor that may have additionally contributed to the bitcoin price drop is the ethereum based Bancor ICO, which raised close to $150 million on Monday, and may have been the source of subsequent price volatility for both crypto currencies. BTC/USD started trading at $2,980 as of 04:40 GMT on Sunday until a new weekly low was achieved the following day on Monday 17:35 GMT at $2,480.01. Tuesday saw a run-up to $2,778 that failed to break-out further and resulted in a two day trading range between the new weekly low and last run-up price. As for why user adoption is stalling, most people are really not that proficient with computers, and I’m assuming that the average person regardless of country of origin or stature, has too many hurdles to get past. Also under the impression that there is global downturn effecting ordinary people more so than the upper echelons. Either way, the rising price of bitcoin is probably the best way to advertise crypto, and motivate people to jump through these hoops.